Col de la Barriere. That name triggers memories of heat and pain. 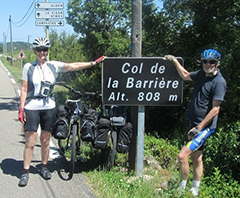 Mid bike tour we were pleased with ourselves after a long fast descent from the top of this Col to the village in the valley below – St Jean de Bruel.- only to discover that we had taken a wrong turn and were faced with the tortuous climb back up. My husband is the navigator and he was beside himself with apologies but also with determination –“There is no choice – we have to go back up”. I suspect I would have looked for an escape route but his assurance and conviction that we could make it and complete the rest of the journey were irresistible. We turned around and returned to the top of the Col. It was where we needed to be to continue our journey to the correct destination. The last time I wrote an article on leadership for this forum was at the time of the Tour de France a couple of years ago (and it is due to start again soon). Cycling represents for me a great metaphor for many things, none less than teamwork and leadership. There is remarkable team work in the way that the riders compete effectively to sacrifice themselves by leading for most of the course so that the nominated leader can sprint through in the last phase of the race. The team supporting Mark Cavendish is a great example of this; as he excels at the final sprint but sometimes barely qualifies in the mountains and would almost certainly not do so if the team around him did not stick by him and morally pull him along. My husband and I are recreational cyclists but the metaphor holds true for us just as much as it does for such names as Bradley Wiggins, Frank Schlek, Mark Cavendish et al. My husband leads and I follow. Following has its challenges. To really get the benefit of the slip stream requires that I keep my front tyre inches from his back tyre. And for that I have to trust his leadership. I have to trust that he will keep his speed and direction constant unless he signals that he is going to do otherwise. But he must do this in time for me to take action. Trust is the consequence of reliability and consistency in performance. He knows and I know that when he takes the lead he is committing to that responsibility. These are the qualities that make the difference – commitment, direction, consistency, reassurance, determination and a willingness to admit when wrong and take action to resume the right course and accompanying that – an ability to let go of the feelings of disappointment or frustration and restore balance to resume the journey. So when he (or I for that matter) take the lead it is not just for fun or to show that we can ride the fastest. We assume a responsibility for the other and we abide by the unspoken rules of how we conduct ourselves at the front. To stay safe and ensure we both arrive at the destination we have to hold the bigger system in our thoughts at all times. It is a very different way of thinking compared to when we follow. Yet another sporting event, Wimbledon, started this week and we can see the reliability of the state of the top players – Roger Federer and Rafael Nadal in particular. They can turn on a dime not only physically but emotionally too. No long term tempers or frustration with either of them. They manage their emotions. They know that energy invested in temper or frustration is energy wasted. Andy Murray for one might do well to model himself more on those two. Sachin Tendulkar the worshipped Indian cricketer is marvelled at for many things, one of them being his ability to manage his state such that he takes every ball as if it were the first. No matter what has happened he can start afresh in every moment. Consistency is paramount. Sport presents us with a clear display of the qualities that make a difference in leading and succeeding. In other words it is not what we say we stand for; it is what we do that counts. Our behaviour and the way we manage our environment communicates to others our true values and beliefs and more significantly our purpose. Only yesterday I read in the paper that Lionel Messi, the outstanding Barcelona footballer, has taken a thinly veiled swipe at teams who play for the sole purpose of victory, believing that enjoyment should be the prime purpose of football. That rather blows all the traditional forms of goal setting out of the window! Are you doing what you do for the fun of it? If you are it is likely that others will find it infectious. A few years ago my cousin died of leukaemia. He was a quiet caring man who had inspired his sons to follow his love of football. One still plays for Barnsley. He rarely took the spotlight in family gatherings but at his funeral the streets were lined with mourners young (mostly) and old, workmates and sports team mates, family and friends. His influence had been huge and we really only knew the scale of it on this day. He had inspired many to appreciate their talents. He quietly encouraged and gave space for others to shine. He was a leader. The question is – are you? The answer is undoubtedly yes but the key question is for what? No point relying on feedback from your funeral. It will be too late to adjust. But you can begin to be aware of your everyday behaviours and what they might be communicating to others with what impact. Or you might just ask. Or maybe just turn around and see who is closely following you!